Happy Thursday Stampers! Drea here with a Thank You Card showcasing some Red Rubber Designs Stamps against a brick background made with gesso and a stencil, and colored with Distress Spray Stains (Antique Linen and Vintage Photo). 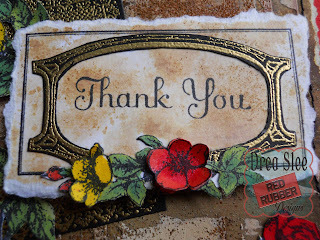 The texture comes from a couple of Distress Embossing Powders (Vintage Photo and Brushed Corduroy) that I added on top. Then I tore and machine stitched the side edges. 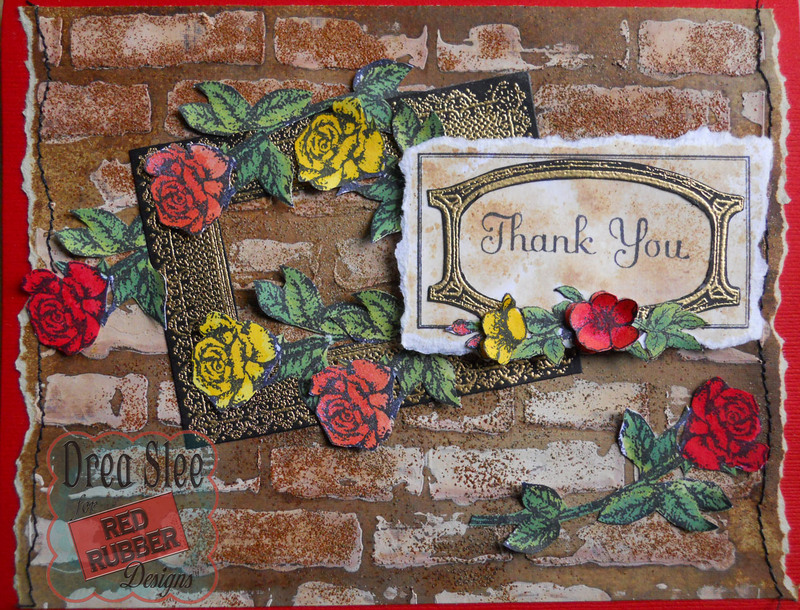 The frame was embossed in gold onto black cardstock using the Fanciful Vintage Unmounted Rubber Stamp Set. 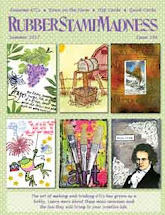 Then I did a lot of fussy-cutting and arranging with the stamped roses, using the Charcoal Flowers Cling Mounted Stamp, and coloring them with sprays and a paintbrush. 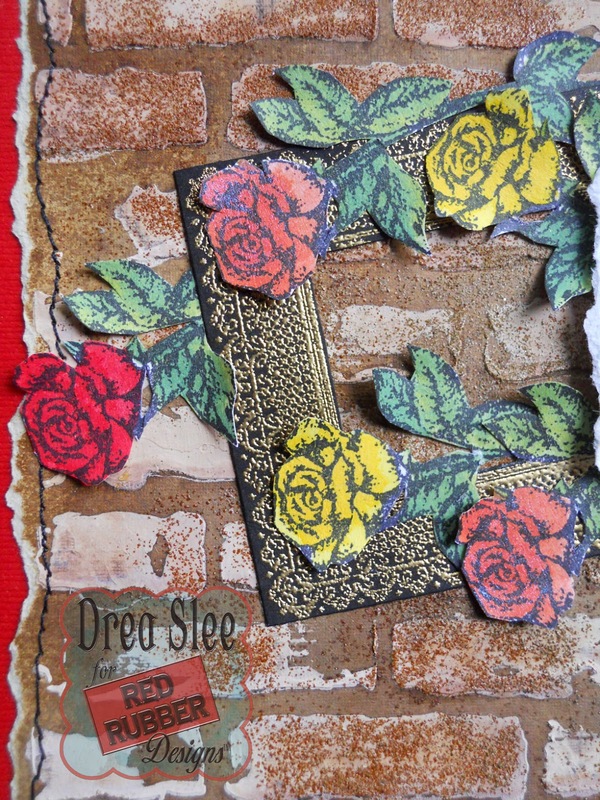 To resemble the bricks on the background, I tore around the edges of the stamped Rose Wine Label and popped it up, after coloring it with sprays and paper piecing it. For even more dimension I curled up all of the flowers and leaves. The sentiment fit perfectly inside of the embossed frame, stamped with the Savvy Sayings Unmounted Rubber Stamp Set. 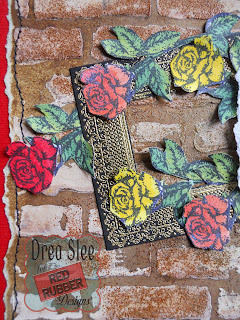 Finally, I used red cardstock as my card base to make the bricks stand out. 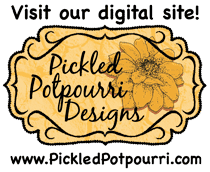 Thank you for your visit, and hoping it brought you some inspiration!